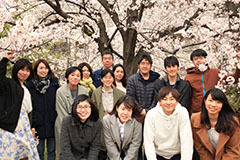 Group of Intercellular Signaling Biology | Division of Biological Science, Graduate School of Science, Nagoya University. Cell-to-cell signaling mediated by secreted signals and membrane-localized receptors is one of the critical mechanisms by which growth and development of multicellular organisms are cooperatively regulated. Signal molecules that specifically bind receptors are generally referred to as ligands. Because membrane-localized receptors act as master switches of complex intracellular signaling, identification of the ligand-receptor pair is one of the central issues of post-genome research. We are working to clarify the mechanisms by which plant development is regulated through identification of novel ligands such as small peptides and their specific receptors using Arabidopsis genome information, biochemical analysis and phenotypic observation. Following complete sequencing of the Arabidopsis genome, a number of genes encoding small secreted peptides have been identified by in silico database analysis. Based on our own analysis, we identified 979 putative secreted peptide genes with an open reading frame (ORF) size between 50 and 150 amino acids in the Arabidopsis genome. These 979 ORFs include many functionally uncharacterized peptides. Although estimation of the total number of biologically relevant secreted peptide signals is difficult at present, the presence of many “orphan receptors” among receptor-like kinases in Arabidopsis suggest that a substantial number of intercellular signals remain to be identified. One structurally characteristic group of peptide signals is “post-translationally modified small peptides”. These peptides are characterized by the small size of mature peptides (less than 20 amino acids) and the presence of post-translational modifications. In these peptide signals, peptide chain length and post-translational modifications are generally very important for their receptor binding activity and physiological functions. Root meristem growth factor (RGF) is a 13-amino-acid tyrosine-sulfated peptide involved in maintenance of the root stem cell niche in Arabidopsis identified by our group in 2010. RGF was identified in a search for sulfated peptides that recover root meristem defects of the loss-of-function mutant of tyrosylprotein sulfotransferase (tpst-1). TPST is a post-translational modification enzyme that catalyzes tyrosine sulfation of secreted peptides and proteins. This approach is based on the assumption that the severe short root phenotype of the tpst-1 mutant reflects deficiencies in the biosynthesis of all the functional tyrosine-sulfated peptides, including undiscovered peptide signals. RGFs are produced from ≈100-amino-acid precursor peptides via post-translational sulfation and proteolytic processing. RGF family peptides are expressed mainly in the stem cell area and the innermost layer of central columella cells, and diffuse into the meristematic region. RGF peptides regulate root development by stabilizing PLETHORA transcription factor proteins which are specifically expressed in root meristem and mediate patterning of the root stem cell niche (Fig. 1). C-terminally encoded peptide (CEP) is a 15-amino-acid peptide involved in mediating long-distance nitrogen (N)-demand signaling. CEP family was identified by in silico screening for a family of secreted peptides that share short, conserved domains near the C-terminus, a feature that is common to several posttranslationally modified small peptide signals in plants. CEP1 is secreted as a 15-amino acid peptide originating from a C-terminal conserved domain (the CEP domain) through posttranslational proline hydroxylation and proteolytic processing. A total of 15 CEP family genes (CEP1 through CEP15) have been found in the Arabidopsis genome. When external N availability is lowered, CEP expression is promptly upregulated in the portion of the root system directly experiencing N starvation. CEP acts as a root-derived ascending N-demand signal to the shoot, where its perception by CEP receptors leads to the production of a putative shoot-derived descending signal that upregulates nitrate transporter genes in the roots. This mechanism supports N acquisition when nitrate is unevenly distributed within the soil. 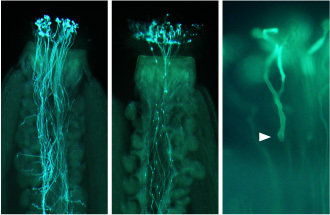 CEP family peptides induced on one side of the roots by local N starvation mediate upregulation of nitrate transporter genes in the distant part of the roots exposed to N-rich conditions to compensate for N deficiency. Post-translational modifications are known to affect peptide conformation through steric interactions with the peptide backbone, thereby modulating the binding ability and specificity of peptides for target receptor proteins. To date, the following types of post-translational modification have been identified in secreted peptide signals in plants: tyrosine sulfation and hydroxyproline arabinosylation. Tyrosine sulfation is a posttranslational modification occasionally found in peptides and proteins synthesized through the secretory pathway in both plants and animals. 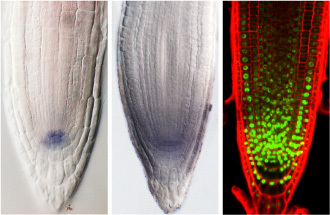 Three tyrosine-sulfated peptide signals—PSK, PSY, and RGF—have been identified in plants. This modification is mediated by tyrosylprotein sulfotransferase (TPST), which catalyzes the transfer of a sulfate from 3′-phosphoadenosine 5′-phosphosulfate (PAPS) to the phenolic group of tyrosine. Arabidopsis AtTPST is a Golgi-localized 62-kDa transmembrane protein identified by our group in 2009. AtTPST is expressed throughout the plant body, and the highest levels of expression are observed in the root apical meristem. A loss-of-function mutant of AtTPST (tpst-1) displayed a marked dwarf phenotype accompanied by stunted roots, loss of root stem cells, pale green leaves and early senescence, indicating the important roles of sulfated peptides in plant growth and development. Hydroxyproline residues in several secreted peptide signals, such as PSY1, CLV3, CLE2, CLE9, and CLE-RS2, are further modified with an O-linked arabinose chain. This modification is also prominent in a large family of extracellular proteins, the so-called hydroxyproline-rich glycoproteins, which include extensins and arabinogalactan proteins. Biosynthesis of hydroxyproline-bound triarabinoside involves two distinct arabinosyltransferases, the first of which is responsible for the formation of a linkage with the 4 position of hydroxyproline [hydroxyproline O-arabinosyltransferase (HPAT)]. We recently purified Arabidopsis HPAT and identified as a novel Golgi-localized transmembrane protein. Loss-of-function mutations in HPAT genes in Arabidopsis cause pleiotropic phenotypes that include enhanced hypocotyl elongation, defects in cell wall thickening, early flowering, and early senescence. In addition, a double mutation in HPAT1 and HPAT3 significantly impairs the growth of pollen tubes, thereby causing a transmission defect through the male gametophyte (Fig. 2). Detailed phenotypic analyses of loss-of-function mutants of HPAT genes will provide a more complete picture of how hydroxyproline O-arabinosylated glycoproteins and glycopeptides contribute to plant growth and development. The receptors or putative receptors for peptide signals identified to date belong to the receptor kinase (RK) or receptor-like protein (RLP) families. Among RKs, the largest subfamily is the leucine-rich repeat RK (LRR-RK) family, which consists of 216 members in Arabidopsis. The majority of receptors for small post-translationally modified peptide signals belong to this family. Especially, an increasing number of LRR X and LRR XI members are now being confirmed as receptors for several endogenous small peptide ligands, suggesting that these subgroups are an attractive target for binding analysis with novel peptide signals. 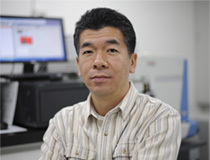 Although both genetic and biochemical methods have been used to identify ligand-receptor pairs in plants, genetic redundancy often interferes with the former approach, and the low levels at which ligand and receptor molecules are often present in tissues can make the latter approach very difficult. As described above, an increasing number of ligand candidates are being identified. If individual receptor kinases could be functionally overexpressed in certain cells at sufficiently high levels and sufficiently high quality for biochemical binding analysis, such a receptor library would facilitate identification of ligand-receptor pairs in plants. To this end, we established a functional and efficient expression system of plant receptor kinases in tobacco BY-2 cells and prepared an expression library of all the potential receptor candidates. This approach was successfully used for identification of CEP receptors. Mode of action of RGF peptide. Expression domain of RGF genes (Left). Localization of RGF peptides visualized by anti-RGF1 antibody (Center). Expression pattern of PLETHORA (PLT2-GFP) transcription factor, a downstream target of RGF signaling (Right). A double mutation in HPAT1 and HPAT3 significantly impairs the growth of pollen tubes. Arrowhead indicates aberrant pollen tube.